So it’s a little futuristic but it’s still a beauty compared to most Parisian bars. With warm wood paneling mixing with a transparent bar and other contemporary features, the cozy drinkery is a contrast from many on this list. Its cocktails, however, are up there with the best of them, and with a restaurant by Alain Ducasse next door, we’d expect nothing less. The menu is available through a QR code, so it’s as geeky as it is pretty. 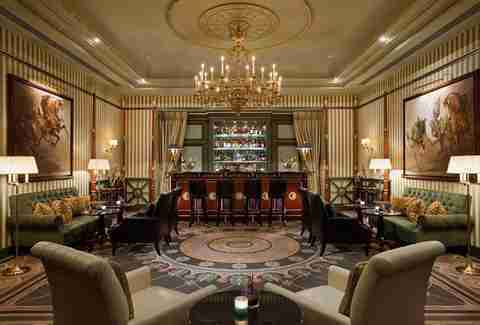 This ground floor bar at the Peninsula Hotel, opened in 2014, is basically like a boozy trip to Versailles. Pricey cocktails and Champagne flow for the well-dressed who show up for tibbles, spilling out onto the terrace when appropriate. The place has history and decoration to rival many of Paris’ monuments, so consider it a cultural experience as well. 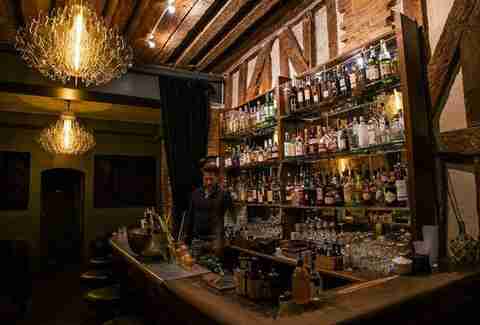 You’ll find the trendiest of the trendy crowding around the bar at the Experimental Cocktail Club, with definite Prohibition-era vibes pulsating through its ritzy little space. Exposed brick and wood beams are the backdrop for chandeliers and dramatic lighting, but also for the cocktails made from the best stuff on Earth. Each drink is priced accordingly, but no one is complaining. Located in the Westin, right down the street from names like Bulgari, Dior, and Rolex, it’s not surprising that you’ll be dropping 21 euros on a Champagne and cucumber mojito. 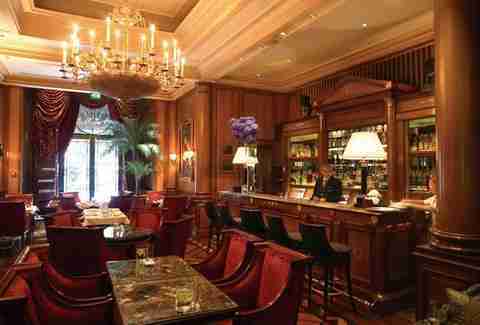 But it’s worth it to enjoy the relaxed and elegant bar decked out in crimson features. In the winter, the heated terrace opens up, adding an extra bit of beauty to this already top-notch bar. 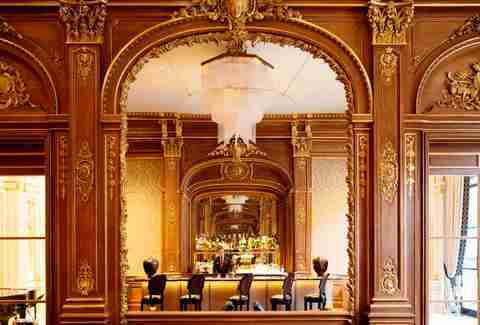 There’s nothing not beautiful about the Four Seasons, and Le Bar sticks to that rule. Intimate and refined, expect to find only the most elite clients sipping bubbly Champagne cocktails here, at 27 euros each. You’re paying for the space, of course, but you might as well tack on the 25-euro finger sandwiches smeared with foie gras to complete the experience. Go big, right? While most of the big-name pretty faces are on the Right Bank, the Left Bank also has its share of noteworthy lookers. 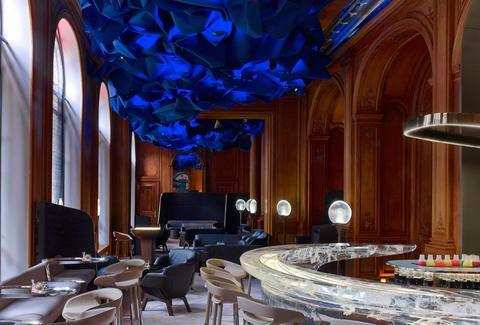 The bar of the Hotel d’Aubusson is as appealing to the eyes as it is to the ears. Regular jazz concerts keep things lively while enjoying drinks from a menu featuring half a page dedicated to whiskey from around the world. It’s a cozy little hideaway in the fall and winter, but in warmer months, the bar spills into the picturesque outdoor courtyard. 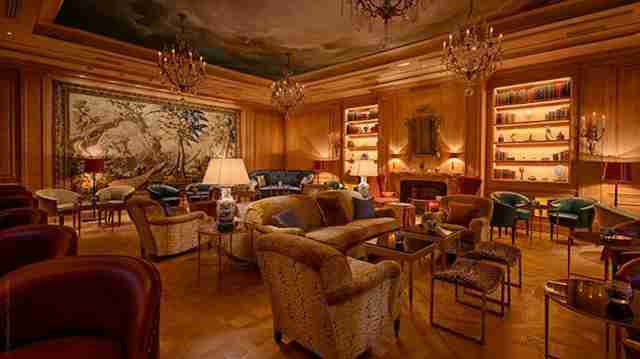 The Hotel Le Meurice was famously the Nazi headquarters during World War II -- and the gorgeous bar might explain why. 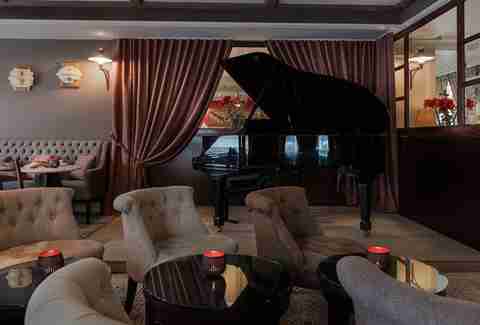 The lounge has a sort of James Bond feeling about it, with high ceilings and leather chairs spread across the room. Food and drink are all worthy of the tidy clientele who stop in, as well as the hotel guests lucky enough to spend a few nights at this pristine property. Cocktails with an Asian edge are just some of the drinks featured at this prestigious bar, not too far from the Eiffel Tower. 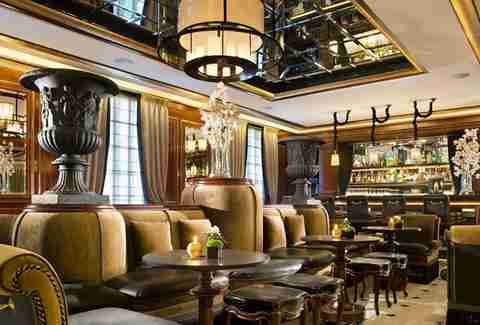 The setting is a mash-up of contemporary and traditional details, with black leather chairs and tiger-print pillows among the Empire décor. It’s not the type of place to just pop into for an after-work drink, but for something a bit more romantic. Try one of the signature creations, like the Gatsby with Champagne, Irish whiskey, and apricot liqueur. Sometimes in Paris it’s best to forgo the cocktails and get back to basics -- wine. 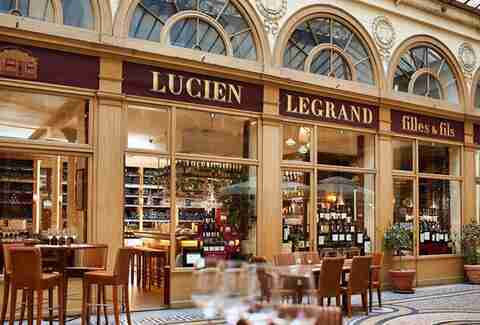 Legrand Filles et Fils has tables spilling into the gorgeous Galerie Vivienne, a restored 19th-century covered passageway. A seemingly endless choice of wine will help make the entire place even that much more beautiful as each glass nears empty. 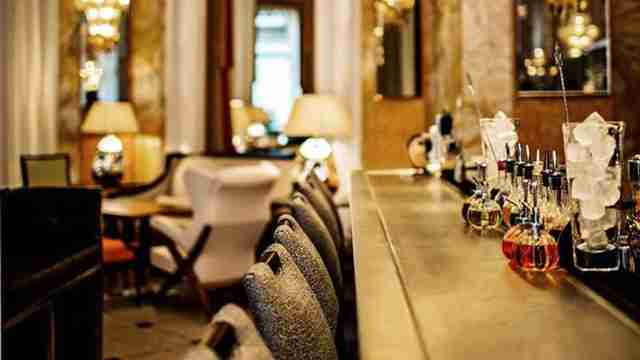 The Hotel Bristol’s bar may feel like some overly elegant study, but it’s so much more than a pretty face. There’s a DJ on certain evenings while impeccable service caters to customers. Signature cocktails change from time to time, but look for the gingerbread Old Fashioned. 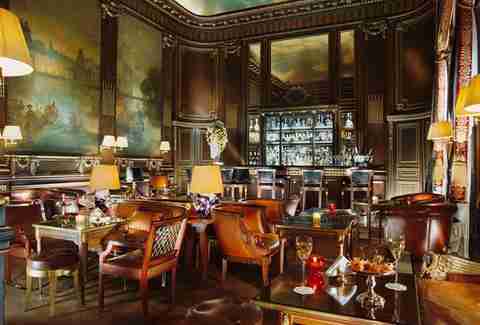 Located in the Prince de Galles hotel, this bar is one for real cocktail enthusiasts. Traditional drinks as well as more modern signature creations grace the menu, including a Thai mojito with ginger and basil. 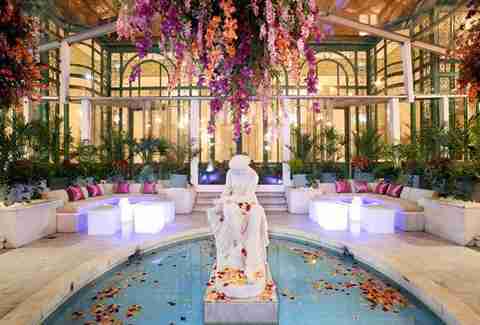 If you are en route from the Arc de Triomphe to the Eiffel Tower as you play tourist, stop off at the Hotel Belmont. It’s got no gimmick and no interesting story -- it’s just gorgeous. The seating is plush and posh without going overboard. It makes excellent cocktails and is obsessively proud of them, given the number of booze-focused Facebook posts over the last year. Who can blame the place though? A bar that dazzling deserves to be celebrated.